So did the STA-9s sound like tube amplifiers? I’m not sure exactly in what respect they were supposed to sound like tube amplifiers, but they sounded a bit bright. Most tube amplifiers don’t sound bright; in fact, some sound a bit rolled-off in the high frequencies. Harmonics were fully developed, and as advertised, dynamic swings, small and large, were fast but not overdone. I’m making these comments with monoblock STA-9 amplifiers driving speakers, using a digital source. Most of my listening today uses digital files, either downloaded PCM and DSD (and a very few MQA) high-resolution downloads, or rips from my CD collection, usually to AIFF format. It’s not that I dislike LPs; I have several thousand in my collection—but my reviewing duties tend to focus on digital gear. Let’s start with a girl-and-guitar album: Eva Cassidy’s The Best of Eva Cassidy (ripped to AIFF from Blix Street Records CD), specifically the audiophile fave “Over the Rainbow.” The NuPrime gear reproduced Cassidy’s expressive voice with a ton of detail and just a smidgen of treble emphasis. When she wailed, the NuPrime system accurately tracked dynamics without any compression. Instrumental sound was a little zingy, with overtones slightly emphasized. Overall sound was nice and open. Turning to instrumental music, I had to try my old favorite La Folia 1490-1701 (ripped to AIFF format from Alia Vox CD AFA 9805), a collection of musical works composed over the indicated period based on the tune “La Folia,” performed by Jordi Savall and his band of Renaissance specialists. The track “Rodrigo Martinez, villancico” was reproduced with lots of detail and a strong, slightly emphasized high-frequency content. It wasn’t peaky or etched, just more prominent than I hear with most components. That HF emphasis highlighted the very busy percussion instruments, making it possible to follow them throughout the piece. Sometimes, the percussion recedes into a background haze, but here it stood out from the mix. Although the KEF speakers can’t really produce the deep bass present on this recording, I was impressed at how much bass the STA-9 amplifiers forced out of those transducers. Sometimes, much larger speakers don’t produce this much impact. Of course, I don’t usually drive the KEFs with 290 watts of power. This was a pleasant though brighter than usual rendition of this piece. Switching to some choral music, I cued up The Tallis Scholars’ well-known performance of Allegri’s Miserere & Palestrina’s Missa Papae Marcelli (96kHz/24-bit FLAC, Gimell). The title track “Miserere” sounded a bit hard, again due to brightness. This recording was the worst-sounding of the lot, with a definitely emphasized treble, so that soprano voices speared out of the mix like lasers. It was actually slightly unpleasant to listen to. Normally, the HF content of this piece is smooth and well-balanced. Recorded in a church setting, the recording features an a capella choral group at the front of the soundstage, with a smaller solo group some distance behind the main group. There was indeed a pronounced sense of separation between those groups. With some misgivings, I switched to my turntable—I was eager to hear some newly acquired LPs. Unfortunately, when I adjusted the HPA-9 and DAC-9 to provide enough gain for my mc cartridge, I heard a slight bit of noise. The gain for the phono preamplifier was set by a combination of the volume controls of the HPA-9 and the DAC-9. Hint: Try to get most of the gain from the DAC-9 rather than the HPA-9. I tried several settings and reduced the noise to a barely perceptible level, but never got it to go away completely. It was masked by the music and surface noise, fortunately, so LPs were pleasant to listen to. Overall, the high frequencies, which with the digital source selections had been a little bright, depending on the program material, were here smoother and more extended, but still a tad brighter than I’d like. 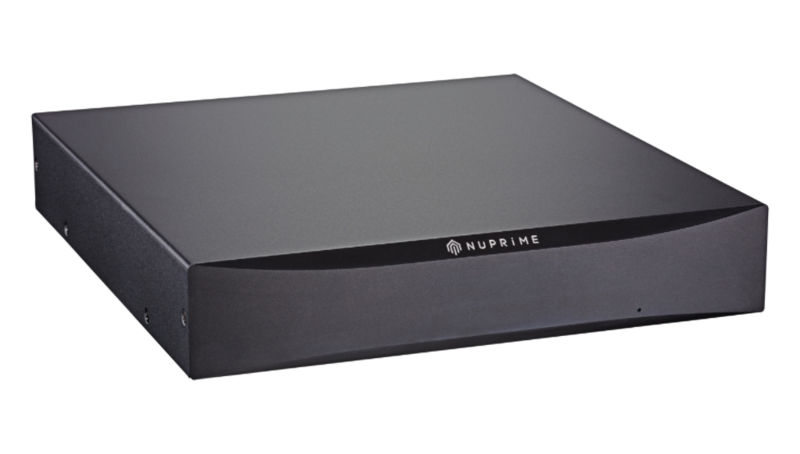 I’m a little surprised by how the NuPrime gear sounded with my reference albums, because just listening to the gear driving the KEFs on other material I had not gotten an impression that the NuPrime equipment so emphasized the HF range. I had thought it was detailed but fairly pleasant. But I’ve listened to my reference albums hundreds of times on a wide variety of equipment, and am well aware that they don’t normally sound bright. I disconnected one of the STA-9s so I could listen to the STA-9 in stereo mode. I used the digital server only for this exercise. The single STA-9 didn’t have any difficulty driving the KEF speakers to loud levels. Tonal character sounded a smidgen lighter. “Over the Rainbow” was still a bit bright but not peaky. Guitar harmonics were still slightly zingy. Cassidy’s voice still had plenty of dynamic punch when she wailed. “Rodrigo Martinez, villancico” also had boosted high-frequency content. With the single amplifier, bass impact was less impressive than with the monoblock setup, though the low end was still pretty powerful. The soundfield was spacious and had a wide spread between the speakers. On “Miserere,” the sound was again brighter than usual, and again, the sense of depth between the main group and the solo group was quite pronounced, more so than I normally hear. To listen with headphones, I disconnected the interconnects from the DAC to the amplifier and plugged them into an analog input on the HPA-9 so I could listen to the DAC-9 played through headphones. Basically, the headphone amplifier in the HPA-9 replaced the STA-9 amp. For purposes of comparison, I used the same server as the source for this part of the evaluation. The HPA-9 produced excellent sound from the different headphones I tried. From the HiFiMan HE400, I heard rather deep bass, with a fairly spacious though not precisely defined soundstage. High-frequency response was not very extended, which is consistent with what I hear from other headphone amplifiers. The Sony XBA-H1 earphones sounded deficient in bass, but that’s the way almost all earphones sound to me—it has to be something about my ears, because I hear plenty of low end from most normal headphones. The NAD Viso HP50 headphones had probably the best overall sound, with decent bass, and open, extended high frequencies. Speaking of high frequencies, the HPA-9’s were a welcome change from the STA-9’s. While extended, the highs were not at all overdone, so the objections I had to the NuPrime system’s sound through the power amplifiers were essentially eliminated through the headphone amplifier. That suggests it was the power amplifiers that were imposing the objectionable treble emphasis, i.e., the brightness. “Over the Rainbow” sounded pretty smooth in the high frequencies, with just a little sibilance from Cassidy’s voice. Her guitar’s timbre seemed to consist of far more body tone and less string tone. “Rodrigo Martinez, villancico” had deeper bass through both headphones, as expected, but with less impact than through the STA-9 amplifiers. “Miserere” was a breath of fresh air, with none of the almost painful brightness I heard through the STA-9. So again it would seem the power amplifier was behind the brightness problem, and the other components—the HPA-9 headphone amplifier and the DAC-9 DAC—were not to blame.